I believe I should start off this blog post with a little bit of back ground. I am not fashion expert, far from it. I do, however, know what I like. I am also a firm believer in sharing what I love with others, so that maybe they can experience the same joy. I never cared for any particular brand. High school was filled with girls & there sparkly jean bottoms. The words “Channel Shoes” keeps coming to mind, but I may be thinking back to far. All I knew was that I adored dresses & skirts. However, wearing such things tended to bring attention to my ghostly pale white legs. Now, I tried tanning lotions & laying on my towel in the backyard. That lasted for about 5 minutes & then I gave up & went inside. Not to mention I learned quickly that I don’t tan, I sunburn. I remember constantly saying in high school, “When I graduate, I’m going to wear red lipstick & heels everyday.” For the most part it been true! Around 18 or 19 I think I found out about Burlesque, it actually may have been the same time the movie came out. It was then that a spiral fascination came. I found out about Dita Von Teese, burlesque queen extraordinaire. I loved what she stood for, showing people other forms of beauty & art. Delving more deeply I realized that this was a beautiful subculture that was the prefect combination of Madonna in Evita (Rainbow High is one of my all time favorite songs), that classy elegance, mixed with those iconic I Love Lucy dresses. It was everything I loved in a style. Classic, edgy at times, skirts & dresses, porcelain like features, finding beauty in all body types, & the ability to create something from nothing. When it all came down to it, it was me. I feel more like myself when I am dressed up then I do when I’m not. Pin Up Girl Clothing, Unique Vintage, Heart of Haute, Vivian Of Halloway & all the other brands that are within these sites have helped to bring out the person that I’ve always wanted to be. There’s much more to this story (isn’t there always), but let’s move on to the glorious Pin Up Girl Clothing Outfit of the Day or as the interwebs likes to call it #OOTD. 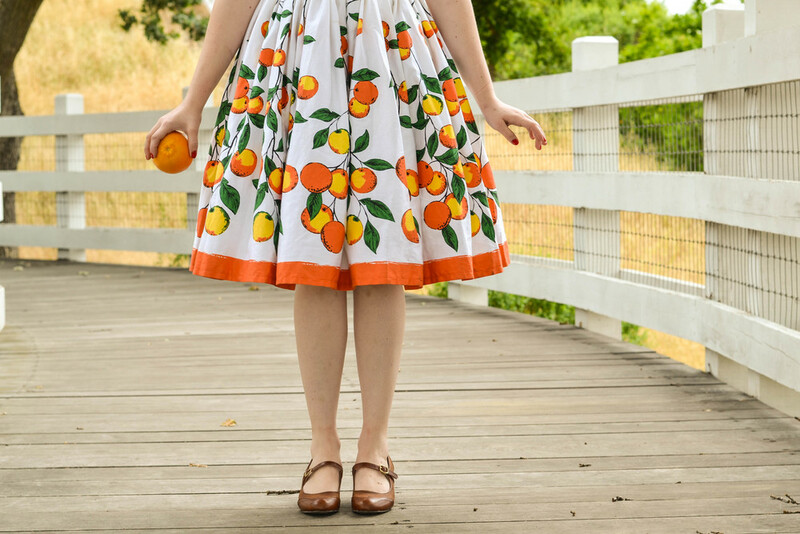 Say hello to the Jenny Skirt in the delightfully bright orange pattern. This skirt called my name the moment I first saw it. It combines the agriculture of California that I love & grew up in & yet it calls me back to my internship at Walt Disney World in Florida (also known for its oranges). Now, the skirt itself is not pure white. I didn’t want to believe it at the time, but it is slightly off white! However, it doesn’t stop me from wearing my white Voodoo Vixen Top. The Voodoo Vixen top is such a simple, but unique beautiful design. The straps cross right on your chest & collarbone creating this elegant effortless look. A word to the wise, put lipstick on after you’ve situated yourself in this top. It’s not very fun, putting it on & looking down to see red smears all across the white fabric. SHOES! Everyone’s new favorite. Bait Footwear. The heels, the colors, the comfort, every penny spent is worth it in my opinion. I wore these shoes all over Disneyland during Dapper Days. There’s magic within these heels! 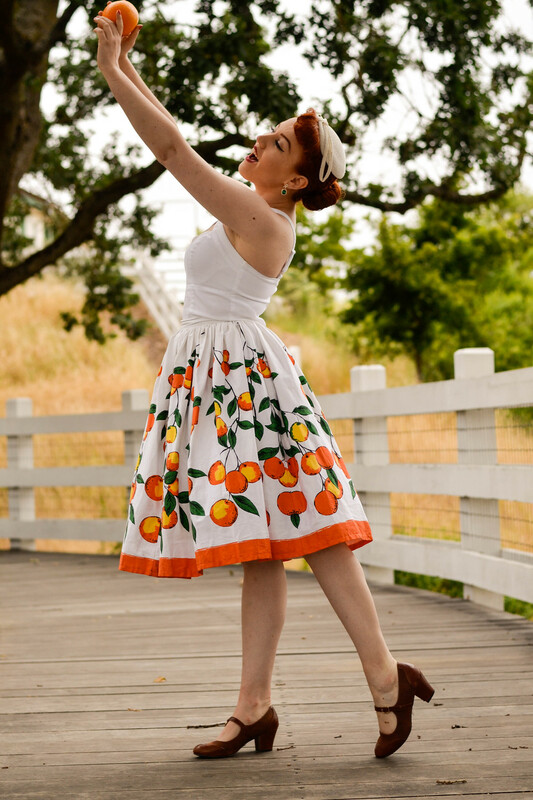 Wearing a petticoat found from a vintage thrift shop called Moon Zoom in San Jose. The love of my life hat found at another favorite thrift shop 2525 Vintage in Hayward!